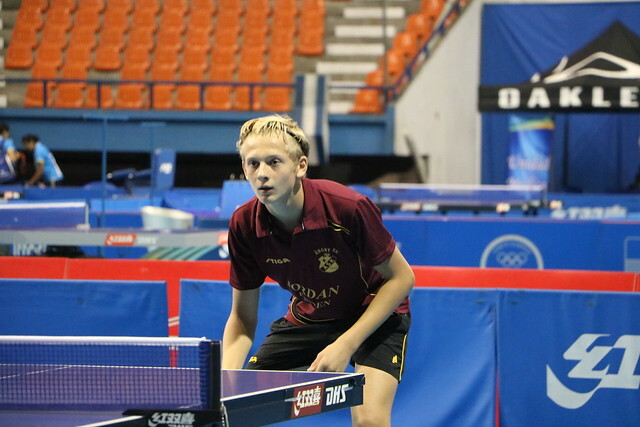 Gold earlier in the week in both the Cadet Boys’ Team and Cadet Girls’ Team events at the 2017 El Salvador Junior and Cadet Open; when play closed on the evening of Saturday 19th August in the Palacio de los Deportes, Carlos El Famoso Hernandez, for Puerto Rico a repeat was both an option and a certainty. In the final of the Cadet Boys’ Doubles event, winners two days earlier Angel Naranjo and Jabdiel Torres meet compatriots Gustavo Cruz and Daniel Hernandez; in the Cadet Girls’ Doubles final, the Caribbean island’s Fabiola Diaz and Kassandra Maldonado oppose the host nation’s Monica Mendoza and Camila Villalta. Notably both Puerto Rican pairs recorded resounding wins en route to the Cadet Boys’ Doubles final. Gustavo Cruz and Daniel Hernandez accounted for El Salvador’s Enzo Leiva and Mateo Martinez (11-2, 11-3, 11-6), before recording a similar margin of victory when facing the latter pairing’s compatriots, René Escobar and Edgardo Sanchez (11-6, 11-4, 11-7). A place in the penultimate round booked; life was no different, a straight games win was posted against Costa Rica’s Ricardo Azofeifa and Alfredo Sanchez (12-10, 11-7, 11-7). Similarly, Angel Naranjo and Jabdiel Torres displayed not a hint of charity. They accounted for Sweden’s Tom Holmqvist and Love Iwarsson (11-4, 11-5, 11-5), prior to ending Guatemalan hopes. At the quarter-final stage they beat Cristian Carrillo and Julian Ruiz (11-3, 11-2, 11-3), in the penultimate round Sergio Carrillo and Jorge Chacon (6-11, 11-8, 11-9, 11-6). Meanwhile, in the Cadet Girls’ Doubles event, Fabiola Diaz and Kassandra Maldonado were in a similar unforgiving mood. A first round win against Costa Rica’s Amanda Garro and Mariana Ugalde (11-2, 11-3, 11-5) was followed with success in opposition to El Salvador’s Lesley Gonzalez and Cristina Machado (11-3, 11-1, 11-5). A place in the final was reserved following success in opposition to Mexico’s Maria José Castillo and Monica Muñoz (11-6, 11-7, 11-3). Likewise, in the opposite half of the draw, there was no stopping Monica Mendoza and Camila Villalta. A direct entry to the quarter-finals, they accounted for the combination of Puerto Rico’s Brianna Burgos and Sofia Perez (7-11, 11-9, 11-6, 11-6), before recording a semi-final success in opposition to colleagues Kenny Orellana and Sara Romero (11-8, 9-11, 12-14, 11-7, 11-9). Play in El Salvador concludes on Sunday 20th August. 2017 El Salvador Junior &amp; Cadet Open Angel Naranjo Jabdiel Torres Fabiola Diaz Monica Mendoza Kassandra Maldonado Gustavo Cruz Daniel Hernandez Camila Villalta.